RHKTriton wrote: I still can't get over just about all vehicles getting these blunt noses grafted on when up to fairly recent times there has been a trend for aero dynamics and better disability directly ahead. A lot seems to be tied to the pop 'SUV' line, which in reality are really just bloated hatchbacks or wagons. i think the so called more aerodynamically styled fronts are a bit of ruse anyway because the requirement to get air to flow through the radiator. as for the looks i dont really mind it even if it has a sort of stromtrooper look about it. 6 speed auto big tick however wonder why they didnt drop the 8 speed from the challenger PS in it. RHKTriton wrote: Have you considered swapping in the auto and transfer box from an mq? Or get the wife upgraded to a manual driver. Independent rear ends seem to freqently waste tyres . Can we keep this thread on topic please fellas? There are other threads for tyres and oils. MN Driver wrote: The new model has front like a smashed crab, very ugly. Can anyone tell me if a 3 seat bench seat might be available? 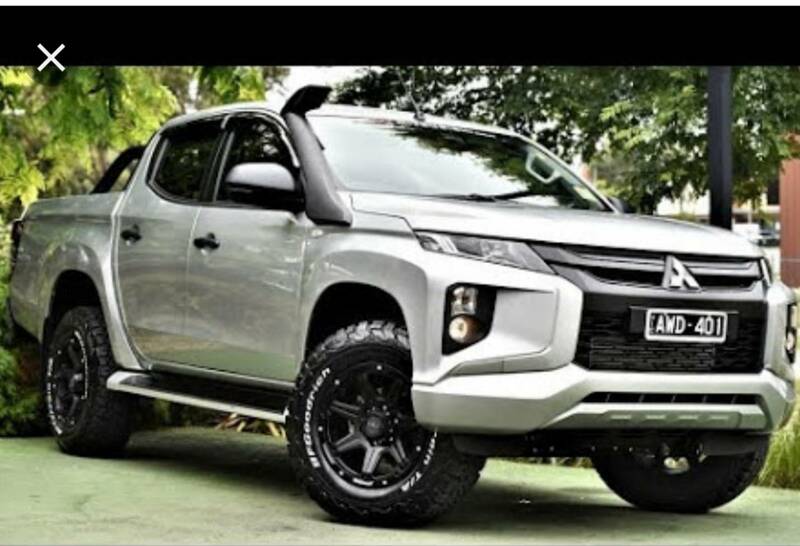 Paid $55,200 with canopy, mats, tow pack and tyres swapped out to BF KO2. Pretty huge tech upgrades in this new model, drives much smoother with the new auto too the old auto used to bump into gears pretty hard occasionally. This is my fourth after a Mk, Mn and a MQ exceed. May not get it for a few weeks due to colours being hard to choose this early on and getting a canopy fitted. Unsure if I’ll stick with the stock size on the KO2 or go up a size or two. Will be interesting to see what size shoes will fit on the MR. The shape of guards seems to possibly be a little more restrictive than the MQ. I’ll probably get the front two windows tinted too, I had the dealer add all the accessories to save me the hassle. Was that for the GLS+ or whatever they are calling it? Last edited by triton guy on Thu Jan 24, 2019 12:27 pm, edited 1 time in total. Threads merged. I could stand it no longer. I think Buzzy might be thinking about an MR.
Good move 5th, was like running along a barbwire fence with a leg each side! Don't let the b'strds get you down!! Pretty dissapointed in the change over. My MQ is MY17 GLS and in very good condition. pricing is around 40k here for basic glx + model at moment.Diff locks ect .will be trading up when double cab and chassis models turn up with flat deck. They normally 35-38k here for glx model 4x4 double cab. Looks like yous guys are paying lot more over the ditch. Any idea what Tyre size that is? triton guy wrote: Any idea what Tyre size that is? 245 70 16 for basic glx model that has black grill ect. That one has aftermarket wheels and tyres. Like everything new, you would grow to accept it. triton guy wrote: That one has aftermarket wheels and tyres. Is it your photo? So no idea what size Tyre it has? I’m tossing up 265/60/18 265/65/18 and 285/60/18. triton guy wrote: Is it your photo? So no idea what size Tyre it has? not my photo just getting and idea what i want when they turn up in next few weeks. i be running same as whats on my mn 265 /75/16 for off road in a m/t as there more selections and nearly 2/3rds of the price than a 18 inch mudder .be running 18 inch in a road tyres. oh well took a MR in a auto for a drive today. What a big difference between the mn and the MR .The mn is like and old dog compare to the MR less road noise more response with plenty of power.The auto was smooth and changed nicely through the gears and better ride and heaps of ground clearance. taking the 6 speed next week for a spin to compare apparently they have changed the gearing ratio compare to the mq and has way more power from doing that.